WELL, I AGREE WITH THE PRESIDENT: Obama Says U.S. Long-Term Debt Load ‘Unsustainable’. Earlier this week, the Obama administration revised its own budget estimates and raised the projected deficit for this year to a record $1.84 trillion, up 5 percent from the February estimate. The revision for the 2010 fiscal year estimated the deficit at $1.26 trillion, up 7.4 percent from the February figure. The White House Office of Management and Budget also projected next year’s budget will end up at $3.59 trillion, compared with the $3.55 trillion it estimated previously. So how about quit throwing trillions down a rathole? Just a thought. Also, maybe sending checks to dead people is a bad start. This week, thousands of people are getting stimulus checks in the mail. The problem is that a lot of them are dead. . . . Antoniette Santopadre of Valley Stream was expecting a $250 stimulus check. But when her son finally opened it, they saw that the check was made out to her father, Romolo Romonini, who died in Italy 34 years ago. He’d been a U.S. citizen when he left for Italy in 1933, but only returned to the United States for a seven-month visit in 1969. The Santopadres are not alone. There’s not much evidence of prudent fiscal management out there at the moment, despite Obama’s talk. 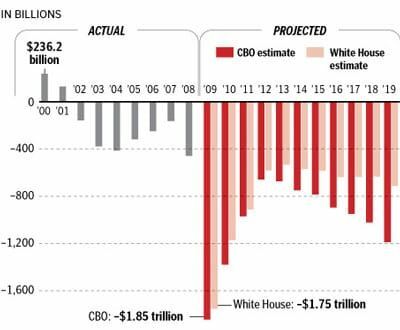 Will someone please remind the president that the time to deal with deficits and reckless spending is before the horses leave the barn–which they do when Obama plants his John Henry on an outrageous liberal spending bill. Will someone also please alert the president to the fact that one million American patriots gathered at “Tea Parties” on April 15 to express their grave concerns about the financial Armageddon that will result unless run away spending and budget deficits are addressed? Remind the president that, although members of his administration dismissed Tea Party participants as “right wing extremists” engaged in unhealthy disagreement with government, the fact is that the Tea Parties fostered healthy debate among citizens who really care about the well being of future generations of Americans. More Tea Parties will follow and perhaps the president should pay attention?